Much Dewchurch Holiday Cottages01981 540008work Self-cateringMuch Dewchurch Holiday Cottages is a family run business owned by the Scudamore family since 1947. The Lowe Farm built in 1870 was part of a glass works before being turned into a working farm and then tastefully renovated to provide a spacious holiday home sleeping up to 22 guests. The Scudamore racing stables have been converted into 4 beautiful cottages, each taking its name from a horse that once trained there. Sleeping 2 to 6 guests dependant on cottage. At Much Dewchurch Holiday Cottages, we understand your 4 legged friend is very much part of the family and your holiday wouldn’t be complete without them. So forget the stresses and worries that come with kennels we are more than happy to welcome all the whole family whether they have 2 legs or 4! 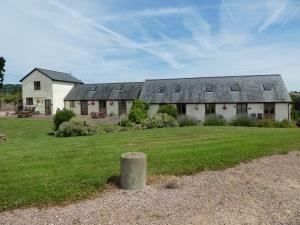 All situated within the peaceful surroundings of 230 acres of fields, woodland and lakes. All properties can be booked together to accommodate smaller parties. A great place for a family celebration and holidays, walking and cycling holidays, large gatherings and corporate events. For the more adventurous, within our 230 acres there is a partly wooded, 5-acre ‘fun combat ground’, dedicated to paintballing and various outdoor activities including archery, laser tag, air gun shooting and clay pigeon shooting, supervised by enthusiastic and energetic marshals, with a pub just down the road to regale one another with tales of bravery and compare ‘war wounds’ at the end of a hard day in the woods! For more information and booking please go to www.hsactivities. Much Dewchurch Holiday Cottages is a family run business owned by the Scudamore family since 1947. The Lowe Farm built in 1870 was part of a glass works before being turned into a working farm and then tastefully renovated to provide a spacious holiday home sleeping up to 22 guests.